In January 2018, YouTube had over 1.3 billion Monthly Active Users (MAUs) worldwide. Every minute, over 300 hours of videos are uploaded by individuals, businesses, charities and other organisations. On any given day, about 5.5 billion videos are watched by some 30 million visitors around the world, either on computers or smart-phones. The world’s top YouTubers earned approximately US $127 million in the calendar year 2017. This figure is sufficient to prove that YouTube provides excellent business opportunities for ordinary people with extraordinary skills to make money at home. The best way to make money from YouTube is by launching your own channel that caters to a niche audience. In India too, several individuals have struck it big by launching their own YouTube channels. Here we take a look at top 10 YouTubers in India. New Delhi-based Bhuvaneshwar Bam, also known as Bhuvan Bam is the biggest YouTuber in India. Bhuvan Bam launched his YouTube channel, BB Ki Vines in 2015. His YouTube videos revolve around the life of an Indian teenager and are full of satire, comedy, romance, parodies and music. By March 2018, BB Ki Vines had over 7.1 million subscribers. Some of his videos have attracted as many as 25 million views. Bhuvan Bam has won the Most Popular YouTube Channel (Asia) accolade at the WebTVAsia Awards held in Seoul, South Korea in 2016. With 5.5 million subscribers, Technical Guruji ranks as the most subscribed YouTube channel in India. It is the brainchild of an Indian born techie, Gaurav Chowdhary, who is considered to be India’s top YouTubers. He currently operates from Dubai, UAE. This channel is very unique since it offers technical education videos in a simple to understand, colloquial Hindi. This popular Indian Youtuber answers questions from his viewers on various technical subjects related to computers, Internet, smart-phones and a variety of other stuff. Aaj Se Jeena Sikho is known to be the best YouTube channel in India launched by an Indian YouTuber, Sandeep Maheshwari. It has an astounding 4.9 million subscribers. Aaj Se Jeena Sikho is all about motivation. Sandeep Maheshwari’s videos speak about real life situations that people encounter daily and occasionally. It teaches them how to find motivation when depressed by external circumstances or any unforeseen eventualities. Nisha Madhulika is a top YouTuber chef. She is an Indian woman who loves cooking. Here eponymous YouTube channel teaches homemakers and ordinary Indians how to make fantastic food from spiced buttermilk (masala chaas) to delicious snacks, full vegetarian meals, soups, salads and lots more. Through her videos, she highlights the pleasures of cooking and shows viewers how common, mundane ingredients and spices can be the to churn out gourmet dishes. Nisha Madhulika’s channel has over 3.9 million subscribers, thus becoming one of the fastest growing YouTube channel in India. Sanam Puri, Samar Puri, Keshav Dharaj and S. Venky are the top YouTubers in India to start off with a band called Sanam. They have a popular YouTube channel- Sanam. The band writes and plays its own songs as well as creates versions of popular Hindi and regional hits. Sanam YouTube channel has over 3.7 million subscribers. It is one of the most highly viewed music and entertainment YouTube channels to be launched by private YouTubers in India. Most other music and entertainment YouTube channels in India are launched by movie and song recording companies. Tanmay Bhat is one of the famous Indian YouTubers known for his standup comedy which blends controversial issues with humour. His YouTube channel, All India Bakchod rank has close to 3.1 million subscribers; thus it is the biggest YouTube channel in India. Born and educated in Mumbai, Tanmay Bhat is also a writer and presenter. He is the co-founder of the channel. Born in 1987, Tanmay Bhat is said to be one of the youngest millionaires of India who made money through a YouTube channel. Kabita’s Kitchen takes Indian cuisine to a whole new dimension. This popular YouTube channel is the brainchild of a top Indian YouTuber, Kabita Singh. She teaches viewers how to make amazing dishes for daily meals to elaborate parties, festivals and other occasions. Kabita’s Kitchen has nearly 2.9 million subscribers in India and abroad. Other than Indian cuisine from various parts of the country, Kabita also posts tutorials on cooking exotic dishes. Her stated objective is to make cooking pleasurable and easy for all. Ajey Nagar is an Indian YouTuber who shot to fame with funny videos posted on his YouTube channel, CarryMinati. He posts sections of viral videos with commentaries in his own voice, games, photos, movie clips and other stuff that are bound to amuse and entertain any viewer. CarryMinati ranks as the eight most popular Indian YouTube channel. It has about 2.9 million subscribers. Zakir Khan describes himself as a typical guy who lives in your neighbourhood. He is not only a top YouTuber in India but also known as an entertainer who has held shows in India and abroad. Zakir Khan entertains people with his YouTube videos that deal with various situations in life and their lighter side. He claims to have experienced every sad and happy thing that typical Indians undergo in their life. Zakir Khan’s famous YouTube channel has over two million subscribers. The last Indian YouTuber to showcase on our list of top 10 YouTubers in India is none other than Kenny Sebastian. This YouTube channel in India has over 1.2 million subscribers. This Indian YouTuber describes himself as a comedian, musician and filmmaker who shuttles between Mumbai and Bangalore and a reclusive creator of digital content for YouTube. His eponymous YouTube channel blends comedy in various real-life situations. Several other Indian YouTubers have made it big by posting on the free video sharing platform. However, these YouTubers in India operate their own brand or business. Their YouTube videos form part of the brand and business promotion. Famous Indian movie stars, singers, spiritual leaders, cricket players and management experts also run their own YouTube channels for specific purposes related to their field. 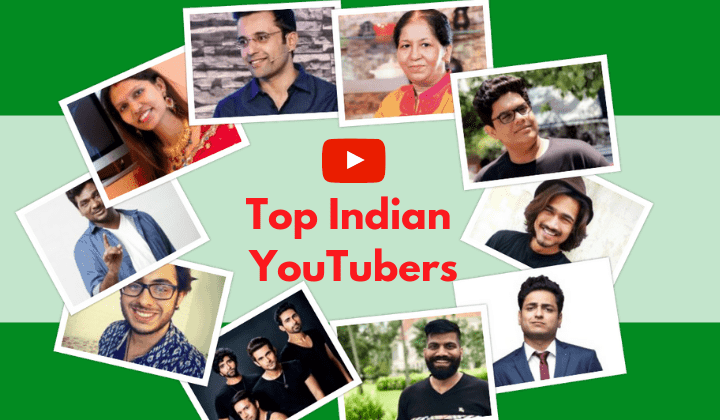 This list of top 10 YouTubers in India is sufficient to inspire any ordinary person to utilise and popularise their extraordinary skills. However, it is worthwhile to remember that becoming a YouTube celebrity is not easy: it involves ingenious ideas and intense hard work to make and post videos that people will like easily. However, YouTube provides an excellent opportunity for everyone to give wings to their skills. How Much is the Cost of Education in India?